Many skin problems are caused by or associated with an excessive buildup of dead skin cells that make the skin thick and dull, and may cause clogged pores, leading to breakouts. A Glycolic acid peel treatment is a specific technique for skin renewal. This procedure rapidly removes the damaged layer of surface skin cells revealing fresh skin, and stimulates cellular renewal and restructuring of deeper skin layers. This treatment can help skin appear smoother, plumper, and tighter and more luminess with more even pigmentation. Here at AVA Rejuvenation, we use the highest quality products. Our Glycolic Acid Peels are pharmaceutical grade, made by Glytone. Your Glycolic Acid Peel will include, a deep cleanse, and extractions (if necessary). A nourishing mask specific for your skin needs, and finish with serums, moisturizers and SPF. A Salicylic Acid peel is unbeatable as a treatment for acne, blackheads, large pores and pimples. It also degreases the skin to help balance oil production, dissolves dead skin cells, exfoliating the skin and opening pores. The acid then neutralizes the bacteria within the pores, which reduces inflammation and is extremely beneficial for our active acne clients. Salicylic Acid also helps with pore size by reducing/balancing oil production and improving skin texture. Our Salicylic Acid Peels are pharmaceutical grade made by Glytone. Your Salicylic Acid Peel will also include, a deep cleanse, extractions, a soothing and nourishing mask, serums, moisturizers and SPF. Our Pumpkin Peel is a 30% Alpha Hydroxy Acid formulation that adds Lactic Acid and White Willow Bark. This multi-fruit complex combines acid/enzyme exfoliation with Bilberry, a circulatory stimulant, a powerful antioxidant, anti-inflammatory and a mild retinoic acid substitute. As a natural repair therapy, it has beta-carotene and ascorbic acids, which benefit the skin topically by combating oxidative and free radical damage. This is an amazing peel for most all skin types and is great for exfoliation, rejuvenation and glow! This DermaQuest Modified Jessners Peel is a blend of salicylic acid, lactic acid and resorcinol for optimum results. The Modified Jessners Peel is used to treat hyperpigmentation, fine lines, congestion, acne, acne scaring and general sun damage. This peel dissolves the top layer of the epidermis to achieve a smoother, softer skin surface while reducing follicle blockage, lightening pigmentation and preventing breakouts. This medical grade peel is safe for all skin types and ethnicities. The Vi Peel has little down time and amazing results when treating, hyperpigmentation and melasma. It improves the appearance of sun damage and signs of aging, improves skin tone and texture, helps to clear acne as well as reducing acne scaring. Reduces pore size and softens the appearance of fine lines and wrinkles while stimulating collagen growth and elastin production, for younger, fresher looking skin. Did you know that the skin begins to lose its glow over time? This is because the skin’s natural shedding of dead cells slows with age, causing it to appear dull and lackluster. 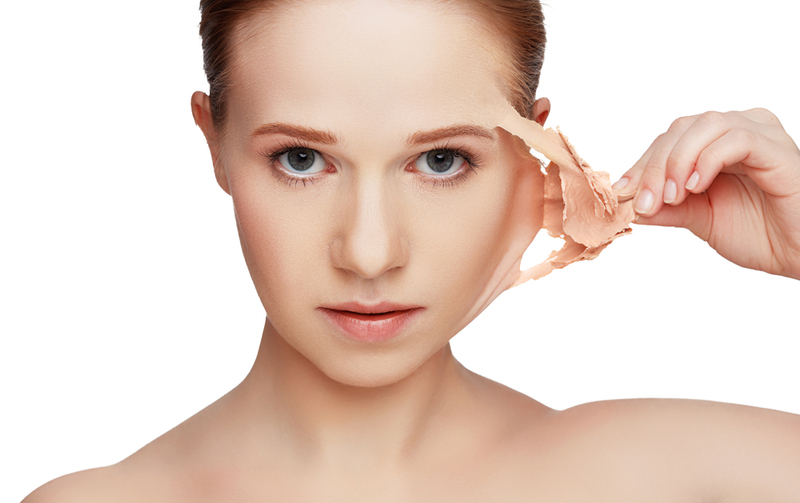 Though new, healthy skin exists below the surface, it is often masked by an old and uneven external layer of skin. Dermaplaning and medical peel combination treatments help reveal healthy, glowing skin and restore a youthful appearance. A medical peel is an in-office procedure during which an acid solution is applied to the surface of the face. The solution is left on for a few minutes, after which time it is removed or neutralized. Most people experience some mild tingling during a medical peel, which usually takes only a few minutes to complete. Following a medical peel, the skin may ‘flake off’ for a couple of days before revealing newer, healthier looking skin beneath the surface. Medical peels are useful for improving the appearance of the skin and conditions like hyperpigmentation, fine lines, sun damage, acne scars and age spots. Why get a combination dermaplaning and medical peel? While dermaplaning and medical peels are effective apart from one another, they work synergistically together. Dermaplaning helps to remove the outer layers of the skin, making the medical solution in a medical peel far more effective. Since dermaplaning enables the acid solution to reach deeper levels of the dermis, the medical solution in a combination treatment is left on the skin for a shorter period of time than it is during a medical peel alone. Dermaplaning can be combined with many different types of medical peels, from mild glycolic and salicylic acid peels to stronger peels containing trichloroacetic acid (TCA). For more information about dermaplaning and medical peels, contact our office to schedule a consultation.